Warmth is essential during a winter period, especially when it comes to our homes – the main source of comfort and coziness in a cold season. A comfortable temperature for living areas, including a living room, a kitchen and a bedroom is 22 °C, the standard for a bathroom is 26°C. If a house is cold, it causes not only discomfort for its residents, but also increases the likelihood of colds and other related illnesses. It is a heating system that is responsible for a comfortable temperature at home during the whole heating season, so let’s take a look at some details. WHY IS A HEATING SYSTEM CONSIDERED TO BE SO IMPORTANT? To begin with, it is worth mentioning that the system of autonomous heating is a necessity and without it the repair or construction of any building is not finished. Therefore, the heating system is one of the most important engineering systems and you need to think about its development first. Use low temperature heating. Such system is the most efficient and economical, as well as safe and comfortable to use. If possible, give preference to a two-pipe heating system, since it has more advantages than a one-pipe system. The one-pipe system you will have two separate pipes going to each radiator, one feeding the radiator (flow), and one taking the water away from the radiator back to the boiler (return). As a result, you can adjust the temperature of each radiator and if one of them fails, you do not have to disconnect the whole system, as it would be in the case of a one-pipe heating system. With atwo-pipe heating system you will have two separate pipes going to each radiator, one feeding the radiator (flow), and one taking the water away from the radiator back to the boiler (return). As a result, you can adjust the temperature of each radiator and if one of them fails, you do not have to disconnect the whole system, as it would be in the case of a one-pipe heating system. But one more thing to mention is that the two-pipe heating system will cost more in terms of initial investment, but as for me, it is totally worth it. Do not forget that the heating system produces dry atmosphere, so I highly recommend to install an air humidification system that can maintain the humidity level within normal limits. For the competent implementation of a heating project, qualified specialists are the only choice. Only properly designed and installed heating system will be the most efficient, economical and easy to use. Preparation of individual engineering solutions for heating systems for any type of building and premises. A unique concept, calculations, a full package of documents and recommendations. A heating system can be powered from a boiler or a heat pump. Depending on the type of fuel, boilers can be solid fuel, gas or electric. The most common one is a gas boiler, it is also one of the most efficient and economical (in the case with condensing ones). A solid fuel boiler is suitable for those cases when there is no chance to conduct a gas pipeline to a house, and electric is good as additional/backup source of heating. The biggest advantage of a heat pump is that it is one of the most economical sources of heating in the world, besides, it does not carry any harmful emissions into the atmosphere. In addition, the heat pump is not only a source of heat in the winter period of time but it can also be used for cooling in a summer period. There also may be different heating appliances: radiators, convector heaters, warm floors. Radiators are easy to implement and they are of a low budget, warm floor is very efficient in supplying heat and economical to use, and convectors are somewhere in between these two systems. 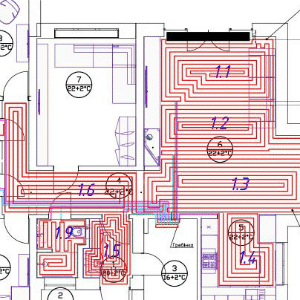 In terms of method of heat supply, they are similar to radiators, and with a warm floor system, the similarity lies in the hidden installation (in the case of underfloor heating). All this equipment can be combined with each other, depending on the features of the premises and the building, the personal preferences of the customer, the budget and the tasks. Installation of heating systems in the future office of Alter Air Company. Heat pump + Boiler combination when it comes to heating the house. What are the advantages? Implementation of heating, water supply, sewerage systems and plumbing in a two-level apartment.